You know this thing about Through the Woods Games? Through the Woods Games category is one of the newest categories appeared on our site, because we have decided to bring you something interesting here on cute-games.com, a category which is inspired from a new television animated series called Through the Woods which presents the adventures of a boy named Rider and his dog, Wolfie. In Through the Woods Games you can find 1 games that we've published for these kids and childrens that are interested to play Through the Woods Games, this game gategory have been created on 15.03.2017. These games with Through the Woods Games have been voted 1 times and the avarage of vote is 5.00 stars. We advice you to play the last flash game from Through the Woods Games, Through the Woods Jigsaw that have been published on 16.03.2017 08:08. Through the Woods Jigsaw its a part of Through the Woods Games category and until now its played 486 times. Try it now on Cute-Games.com! 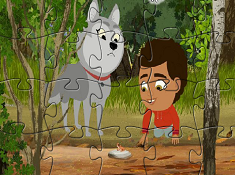 If your like the Through the Woods Jigsaw game you can write a comment in the game page. Recommend this game to your friends if you like it! Find More About Through the Woods Games! Through the Woods Games category is going to have a lot of surprises for you, so just stay tuned and check the site every day for new and interesting games with your favorite characters. In this games category you can see a lot of games with the main characters from the Curious World show. In this category you are going to meet new interesting characters that I am sure you will love because they are funny, they have a big heat and they are ready for a new adventure every day. If you have watched the Curious World show called Through the Woods I am sure you know the main characters and you will be surprised when you will see that here on our site now you can also play games with your favorite heroes. The main character from the show, Rider, is a young boy who loves exploring. In his backyard is the forest and he and his dog, Wolfie are going for a new adventure in the forest everyday. In each episode you can see a new challenge that Wolfie and Rider has to face and I am sure you will live the emotions and the adventures with the heroes. They meet new animals in the forest every day, they ask question about the fauna and the vegetation, they discover new things and learn a lot about nature. The kids whoa re watching the show have the chance to learn also a lot of interesting things, I am sure you will love the series if you watch it. I am going to bring you for the first time the Through the Woods games category only here on our site, the best games site in the country and in the first place we have for you a puzzle game. The game is pretty difficult because you have just three seconds to observe the image with Rider and Wolfie before the pieces star mixing. When they are mixed you have to arrange them, to place every piece at iti place. In the image you can see Rider who has just made a new discovery. He is looking at a new animal he has discovered in the woods. There with him in the forest is his loyal dog, Wolfie. The dog always protects Rider from the dangerous things from the forest and they are best friends. They have a lot of adventures together and they make a great team. Together they can get over any obstacle and nothing is too difficult for them. If you had a great time playing these games from the Through the Woods games category you can give us a like of a g plus to help us promote it for all the kids who are big fans of the series or who just want to meet new interesting characters. I think you should try all the games with Rider and his dog because only in this way you can find your favorite one. Rider is curious all the time, because he wants to learn more about nature. In the series the kids can learn how to protect nature, how important is recycling and how important is to take care of the vegetation. This games category is going to bring you a lot of games but you have to tell us if you want more. Our site is going to do its best to surprise you every week with new and interesting categories for boys and girls. I think in a lot of games with Rider and Wolfie the first level will look easier for you than the next ones, because you will get indications from the computer, but you don`t have to hurry to judge because in higher levels you will be on your own and it will be more difficult. The animated series is going to boost the children`s confidence, it will teach them how important is the relationship with the family, with a pet or with the nature. I thin this category is going to impress you because it has great characters and a lot fo challenges. In the first game appeared in this category you need agility, attention, ability and so on. Do your best to solve that puzzle as fast as you can if you want the chance to reach the podium where are only the best of the best players in the world. In a comment you can tell us what do you think about Rider and his dog, if you like the category and if you want more games like these. Help us promote the category for all the kids who love this animated television series.